More than 10 years ago, Michael Arias read Taiyo Matsumoto’s cult-classic graphic novel, ‘Tekkonkinkreet’. Ever since, heâ€™s dreamed of bringing it to life on the screen. Tekkonkinkreet is a play on the Japanese words for concrete, iron & muscle and the title is meant to symbolize the destructive power those elements have on the world of the imagination. This time, the world of imagination definitely triumphs. After 40 months in production at Tokyoâ€™s Studio 4ËšC, Arias (who has lived in Japan for over 15 years), has created a beautiful story that combines cutting edge computer generated imagery with classic hand drawn character animation. Itâ€™s an intensely ambitious work of art that will feed your soul. We are immediately plunged into a dizzying chase through â€œTreasure Townâ€, a futuristic city as densely imagined as (and deeply influenced by) anything in Blade Runner. We catch wonderful details on the smallest of street signs, even ashtrays, as two street kids, named Kuro (“Black”) and Shiro (“White”), lead a gang of boys trying to muscle in on their turf on a merry chase through underground tunnels and up into the air. Kuro and Shiro live in an abandoned car and look out for each other as brothers. The only adults in their world are Yazuka gangsters who accept them as part of the firmament and a kind old street beggar who occasionally shares the public bathhouse. Making sure White, the smaller of the two, is properly dressed and fed, keeps Black focused and gives him a family to care about. For his part, White, a simple being, full of sunlight, keeps Black connected to the innocent child inside and tempers his anger at having to grow up way before his time. Together, theyâ€™ve managed to adapt to this world that’s constantly shifting and changing around them in a resourceful and even, joyous manner. Then an evil real-estate developer (backed by extra terrestrial robots no less) starts to rip Treasure Town down around them. Arias keeps the heart rending story that captured his imagination a decade ago at the center and surrounds it with a combination of CGI and beautifully hand drawn characters. Even the bad guys stand out; wonderfully quirky, world weary, hopeful, greedy, evil individuals with back stories and a growth curve. When some of these evildoers bite the dust, we are a little sorry to lose them. The lavish attention to detail will make viewers want to see the film again to catch all the goodies cramming every frame. Arias and his team took hundreds of photos of old world bathhouses, markets, abandoned amusement parks, and decaying street signs and sound designer Mitch Osias collected raw material in both New York and Tokyo to inspire the patina of Treasure Town. The icing on the cake is a great original score by the electronic music group, PLAID. After Kuro and Shiro save each otherâ€™s lives countless times, they are finally, brutally separated and Shiro must battle the darkness within himself on a hellish black star in outer space. Curiously, this apocalyptic scene was the only section that fell a little flat for me â€” I think I may have been on sensory overload by the time we reached that point in the story– still, thatâ€™s a very small quibble about a film that I can’t wait to see again. TEKKONKINKREET is the first film Arias has actually directed but heâ€™s had a fascinating journey to this point. He taught himself programming and math and computer graphics for the most part; creating special effects for films like The Abyss, Total Recall and The Matrix, designing film titles and sequences for David Cronenberg, Jim Jarmusch, Spike Lee and the Coen Bros., helping visual effects pioneer Doug Trumbull develop the Back to the Future ride at Universal Theme Park, inventing and patenting “Toon Shaders,” a software, which helped lend 3-D computer graphics the look of traditional 2-D animation in Hayao Miyazaki’s Oscar-winning Princess Mononoke and Dreamworks’ The Road to El Dorado, and collaborating with the Wachowski Bros. on Animatrix, an anime extension of the first great Matrix film. And now, he has become the first foreign born director to helm a feature length anime film in Japan — a story as sweet and hopeful and dark and compelling as any Grimmâ€™s fairy tale. http://search.japantimes.co.jp – there’s a great photo of MICHAEL ARIAS here ! 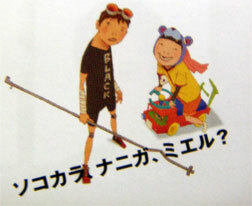 Michael Arias will introduce Tekkonkinkreet at The Museum of Modern Art on Thursday, April 25th at 8:30.